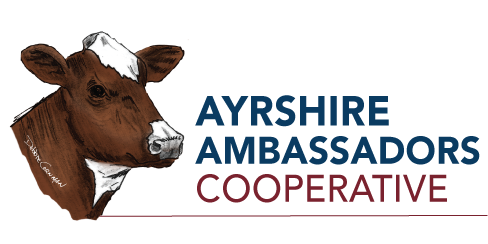 The Ayrshire Ambassadors Cooperative was founded in 2016 by a group of dairymen who want to be outspoken advocates of the Ayrshire breed. These individuals believe in the Ayrshire’s potential to regain relevance along with national recognition for its economic advantages; and, they share an excitement about opportunities to excel in both the commercial dairy market, and in niche markets that place a high value on grazing systems, sustainability and direct-to-consumer marketing of whole milk and/or cheese, including organic Ayrshire milk products; and animal rights’ desire for naturally polled animals. Listed among endangered livestock watch list by the Livestock Conservancy, registrations for this historic breed have been reduced by half since 1970. The founders are eager and determined to turn this trend around and leave a growing legacy for Ayrshires. We are recruiting like-minded individuals, families, farmers, and others to join our cause. For more information about getting involved in the Ayrshire Ambassadors Cooperative, we invite you to view the benefits of membership or contact John Rodgers directly at (717) 250-8010. Click HERE to join Ayrshire Ambassadors Cooperative.